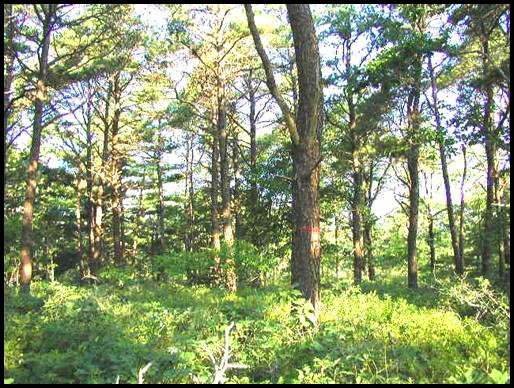 Manuel F. Correllus State Forest (MFCSF) is located in Duke's County on the 100mi2 island of Martha's Vineyard , six miles off the south coast of Cape Cod, Massachusetts . The forest comprises 5,190 acres of scrub oak, oak woodland, pitch pine forest, and conifer plantation vegetation in the center of the island . MFCSF was established in 1908 as a reservation for the last remaining population of the heath hen (Tympanuchus cupido), a race of the prairie chicken. The forest was managed as habitat for heath hen until its extinction in 1932. Following establishment of MFCSF, fire was fought vigorously with limited initial success. Between 1867 and 1929 sixteen fires greater than 1,000 acres burned on Martha's Vineyard. Many of these originated in or burned through the dry central regions of the Island. Large fires in the 1920s are thought to have been a contributing factor in the extinction of the heath hen. 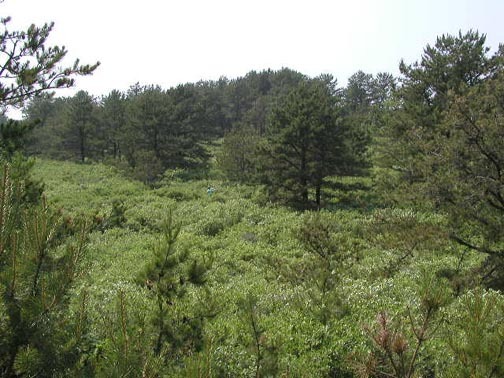 The large, frequent fires prior to 1955 controlled the vegetation patterns on the central Martha's Vineyard sand plain, the area that now includes MFCSF. Since 1955 fires on the plain have been reported more frequently, but they have been smaller and far fewer acres are burnt each year. Fire no longer impacts vegetation at the landscape-level. This change in the role of fire has led to an increase in the cover of oak woodlands and a decrease in scrub oak since 1955. Although the size of fires has decreased in the past 50 years, the potential still exists for large fires on windy spring days before leaf-out. 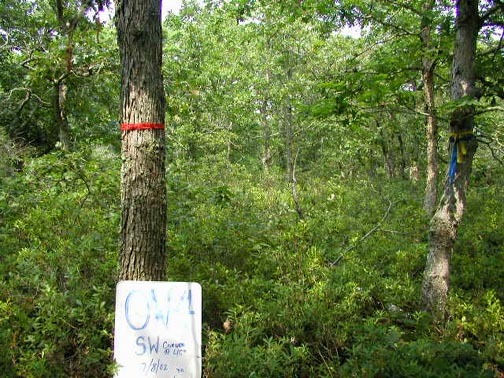 A current concern of the Massachusetts Department of Conservation and Recreation (DCR), which manages the Forest, is to reduce fire danger to adjacent residential property through the creation of buffer zones along the Forest's boundaries. M.F. Correllus State Forest vegetation consists of plants that are well adapted to sandy soils and periodic fire. The dominant canopy species are pitch pine (Pinus rigida) and white oak (Quercus alba) , with black oak (Quercus velutina) and scrub oak (Quercus ilicifolia) present as well. Ground cover is dominated by upland ericaceous shrubs including huckleberry (Gaylusaccia baccata) , blueberries (Vaccinium spp.) , and wintergreen (Gaultheria procumbens). Both the understory and overstory vegetation provide critical habitat for numerous native plant and insect species. 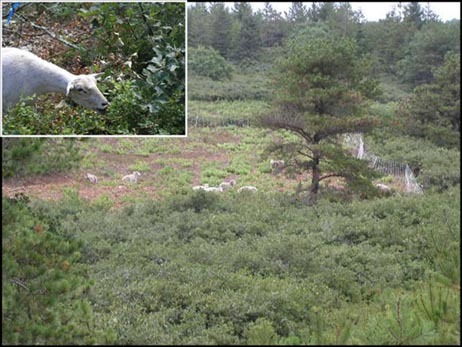 In 2003, the Massachusetts Department of Conservation and Recreation (DCR) in cooperation with the University of Massachusetts at Amherst initiated research to evaluate various fuel treatment methods including: thinning of pitch pine stands, mowing of shrub understories, and grazing of regrowth by sheep. The goals were to determine the effectiveness of fuel-break construction techniques in reducing fire spread and to evaluate the impacts of treatments on rare plant and insect species. With funding from DCR, we established 27, 0.5-acre plots--nine in each of three vegetation types: Scrub Oak, Pitch Pine and Oak Woodlands. These plots are contained within a larger 80-acre area that has been developed as a 500-foot-wide fuel break adjacent to roads and residences near the southwest corner of the forest. The plots were sampled in 2002 prior to treatment, were treated in 2003, and were sampled again in 2004, both before and after burning. Pre- and post-treatment sampling documented rare species abundance and the effects of treatments on fuel loads. All twenty-seven plots were burned to evaluate effects of the treatments on fire behavior in April/May 2004. 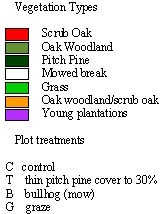 The nine 0.5-acre plots in Scrub Oak vegetation were divided into three treatments, with three replicates in each treatment: Mow, Mow/Graze, and Control. The Mow plots were mowed during summer 2002 to a height of approximately 10 cm using a Rayco FM 225 flail (Brushhog) mower (see photos below). At least two weeks after mowing (to allow for shrub and herb regeneration), the Mow/Graze plots were grazed by sheep in summer 2002 and again in mid-to-late summer 2003. Control plots were not treated. Photo of the Brushhog Grinder/Mower at work on the Vineyard. Photo of untreated scrub oak plot. Note the person near the center of the photo for scale. with the Brushhog. The photo clearly shows a reduction in fuel height and amount. Table of fuel weights and heights for scrub oak treatments. Data collected Spring, 2004 before leaf-out. Graph showing the effectiveness of the treatments in reducing fire behavior. Graph prepared by John Norton-Jensen. 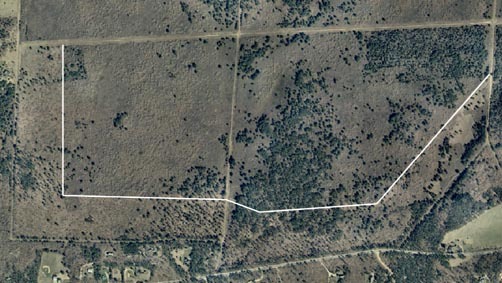 The nine 0.5-acre plots in Pitch Pine vegetation were divided into four treatments: Thin/Pile burn (2 plots), Thin/Mow (3 plots), Thin/Graze (1 plot) and Control (3 plots). Originally there were to be three Thin/Graze plots, but when it became apparent that sheep would not feed on Pitch Pine needles, slash was piled and burned after thinning the remaining two "Thin/Graze" Pitch Pine plots. 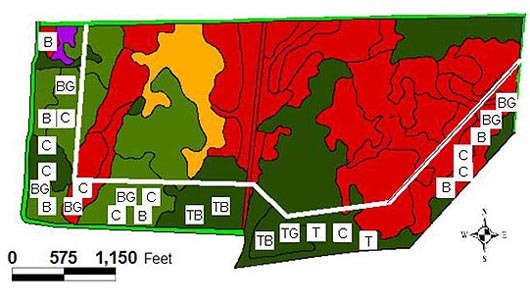 In all thinned plots overstory Pitch Pines were thinned during 2002 to a basal area of 20-30ft2/acre using a feller-buncher, removing approximately 90 trees or 70ft2/acre. In the Thin/Mow plots, the understory vegetation was then mowed to a height of approximately 10 cm with the Brushhog mower. Control plots were not treated. Photo of the same Pitch Pine plot, after thinning and mowing with the Brushhog. Table of fuel weights and heights for pitch pine treatments. 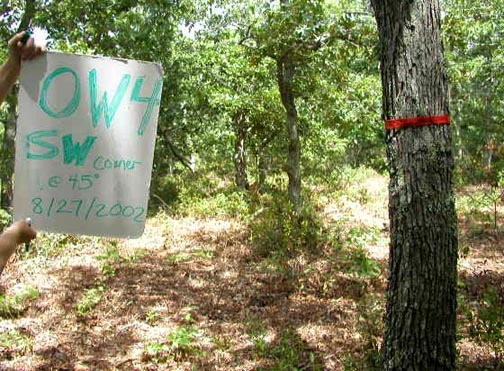 The nine 0.5-acre plots in Oak Woodland vegetation were divided into three treatments, with three replicates in each treatment: Mow, Mow/Graze, and Control. In the Mow plots shrub layers were mowed during summer 2002 to a height of approximately 10 cm using a Rayco FM 225 flail (Brushhog) mower. Mow/Graze plots were mowed in 2002 and grazed in late-summer 2003. Control plots were not treated. Photo of Oak Woodland plot number 4, before any treatments. Photo of Oak Woodland plot number 4, after mowing with the Brushhog. The tree with the red tape is the same tree in both photos. Table of fuel weights and heights for oak woodland treatments. Sheep graze all resprouts one year following grinding at a cost of $900/acre. Mowing followed by sheep grazing virtually precludes the need or opportunity for the use of prescribed fire for up to two years, but is probably logistically prohibitive in most places. Mechanical treatments in scrub oak cost approximately $200/acre using a Brushhog mower. Mowing and then applying prescribed fire also dramatically reduces fuel loading. Prescribed burning costs $200-300/acre. The most cost-effective way to reduce the risk of catastrophic wildland fire is a combination of thinning stands, mowing understory vegetation, and prescribed fire. 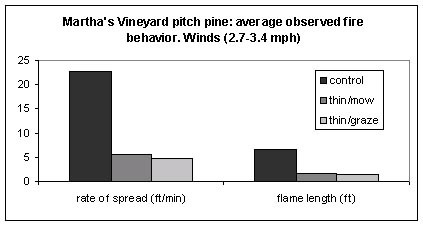 Thinning pitch pine to a residual stand of 30 ft2 per acre dramatically reduces the risk of crown fire by increasing the wind speed at which crowning might be expected to occur. 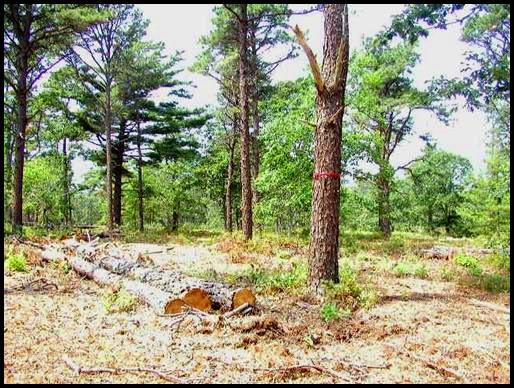 Because local markets for poles and saw logs are lacking on Martha' s Vineyard, the state must pay $1500/acre to thin pitch pine stands. Elsewhere it should be possible to sell products resulting from thinning. 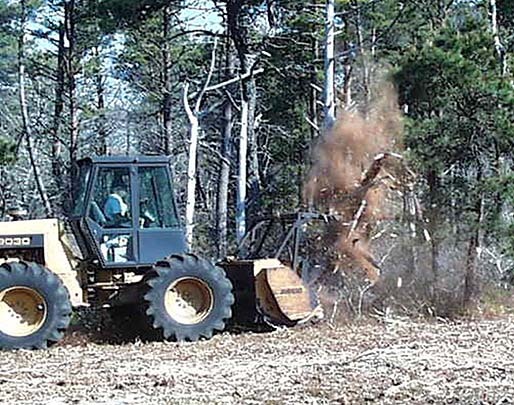 Burning slash in piles reduces the intensity of surface fires at a cost of $200/acre. As with scrub oak vegetation, mowing followed by sheep grazing virtually precludes the need for prescribed fires or further treatments for up to two years. The most cost-effective way to reduce the risk of catastrophic wildfire in oak woodland stands is by combining mowing and prescribed fire treatments. Mowing costs approximately $200/acre, and prescribed burning costs $200-300 per acre. We have generated nine custom fuel models for the fuels (both treated and untreated) of Manuel F. Correllus State Forest. The nine models are for: 1) Pitch Pine untreated fuels, 2) Pitch Pine fuels thinned and then grazed by sheep, 3) Pitch Pine fuels thinned and mowed, 4) Oak Woodland fuels untreated, 5) Mowed Oak Woodland fuels, 6) Oak Woodland fuels mowed and grazed by sheep, 7) Scrub Oak untreated fuels, 8) Mowed Scrub Oak fuels, and 9) Scrub Oak fuels mowed and grazed by sheep. View or download the models by clicking here (33KB Excel wkst). If you're planning a trip to the Vineyard, consider printing the brochure Nell Blodgett and John Norton-Jensen put together about our research at the state forest. Get the brochure here (pdf). © 2005 Kimberly Iwamoto. This is the Web site for the Joint Fire Science Program Northeast Barrens Fuels Demonstration Project. This site is hosted by the Department of Natural Resources and Conservation, University of Massachusetts, Amherst. Produced and maintained by the lab of Dr. William A. Patterson III. Please contact us with questions or comments at nebarrensfuels@nrc.umass.edu.